The gold bull market of the 1970's was far different than the one today in large part because it was focused almost exclusively in the United States. Today the entire world is on a fiat paper money system, and there is a collective awakening from citizens and investment managers (not just in the United States but in every country) that something is wrong with the money they are working for every day. There is a second major difference from the 1970's compared with today. Beyond every day citizens and investment managers there is a third party that has entered the party as well - governments. As the currency wars rage on, there have been a select few countries that have put the pieces together early and are now trying to play catch up to prepare for the end game. One of those countries is China. It is impossible to track exactly what the Chinese government is doing in the gold market, but we can use the data we have available to put some of the important pieces of the puzzle together. It is important to understand that if we could see behind the curtain to everything China was doing, (and if they are acting in a manner that I am going to speculate they are here) then the gold price would already reflect this action (be far higher in price). First we begin with the "official" data we have available. 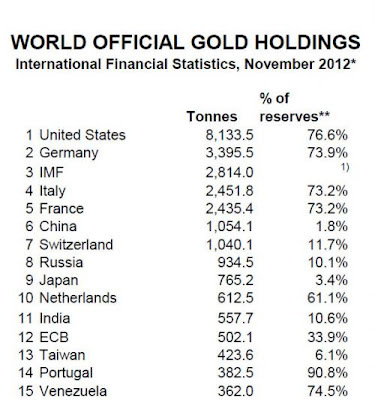 The most recent official gold holdings of the major countries around the world show that while China stands at sixth place, they currently have less than 2% of their paper currency reserves backed by the gold they own. This is an extremely important concept to understand. It means that if paper money collapsed tomorrow and countries had to revalue their currencies and move back to a gold standard (that existed throughout hundreds of years before 1971), China's wealth would fall by 98%. This is in stark difference to the United States which has over 76% of its currency backed by gold. China knows this, and I believe they are doing everything in their power to quietly raise their gold holdings to protect them from what is coming. There are two places where we can see this occurring. The first is in their long standing recycling of the paper dollars they receive. Up until just a few years ago, when China took in American IOU's they recycled almost all of it back into the United States. 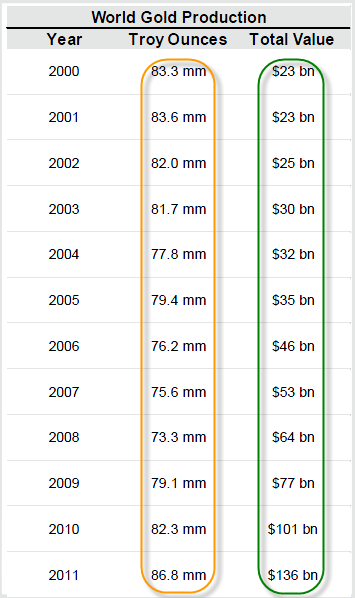 Their treasury holdings recently have not only stagnated, but they have fallen by $125 billion year over year. This is something that almost no one talks about and many people still assume today that China is buying up US dollars to "take over America." They are playing a far different game completely; a much smarter one. So where are all those excess dollars going? As I mentioned, we cannot see everything they are doing because they do not have an open balance sheet like a business, but we can track some of their actions with specific buy orders. One of those is the imports (purchase) of gold from Hong Kong. 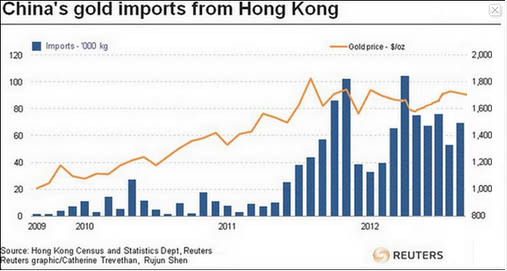 Since early 2011 their imports from Hong Kong have skyrocketed and continued month over month at an unrelenting pace. China has imported more gold just in 2012 alone, 582 tons, than India has in total reserves (we still have 3 more months of data coming this year). That number is staggering. China is racing against the clock. They know that at some point the paper they own is going to be revalued in the open market. Any time gold falls in price they have taken the opportunity to enter the market with massive buy orders. Some may be wondering how China could accomplish this with gold already in a "bubble" as we have read and seen in mainstream news. With everyone now purchasing gold it must make a huge portion of the global asset allocations right? 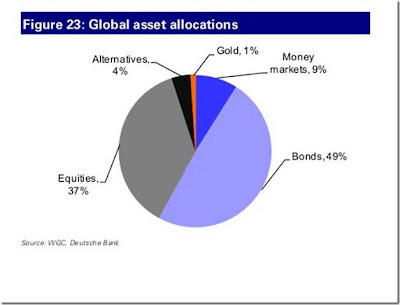 Back in 1980, gold and gold related assets made up over 15% of asset allocations. Where does this number stand today? Less than 1%, seen in the pie graph below. How about the supply side? 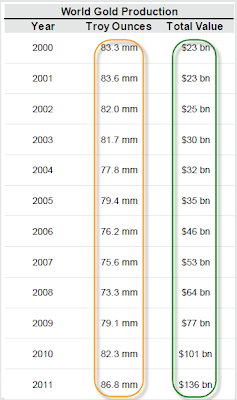 At the peak of every bubble you see supply surging (tech IPO's in 1999, new homes in 2005) as new investors looks to take advantage of the current high prices. Spot the point on the chart below where you see the massive spike in supply due to current gold bubble "euphoria." Gold production (circled in yellow), after being stagnant for over a decade, is now back to only about where it was in 2001! The total value of this production (circled in green) is the paper price revaluation, not an increase in actual ounces. This opens up a conversation for the value found in gold mining stocks today - something I will save for another day. Next up we have a great chart showing the total fake money created between 1930 to 2008 by the four main developed regions of the world: USA, Britain, Europe, and Japan. It then shows the total fake money created in these countries since 2009. So if new supply stays stagnant (it takes years to bring a mine into production), China's demand continues to grow, and total global asset allocations moved just slightly above the paltry 1% seen today, what do you think would happen to the paper price of gold? This is how we will enter the mania stage of the market. If you think the available gold supply is small there is another precious metal that could be considered a spec of dust in the vast ocean of paper money around the world today. Throughout history there has been at least ten times the amount of above ground silver available to purchase compared to gold. This is why gold has always been considered a "more" precious metal. Today there is 50% less silver available to purchase than gold. This means that based strictly on a supply basis revalued against paper money silver should be worth 2 times more than the price of gold. Today it is worth 53 times less. What if just a small fraction of the paper money moved toward the physical spec of dust that is silver? Rather than scare you with a number, I'll let your imagination think about where the paper price could go. Let's get on to the Mining Co. Stocks conversation asap please. Would you consider Physically backed gold and silver ETF's a safe investment ? (PHGP and PHSP? Or is physically owning the metal yourself and keeping in a safe place the only truly safe way? Seems dangerous - especially when it comes time to sell/ cash in ? How you can you be sure when you come to sell you dont get robbed? Your thoughts on the ETF's would be appreciated. I would diversify. Rather than use the ETF's such at GLD and SLV, I would look at other options such as the Sprott Physical Gold or Silver funds, or take a look at the Central Fund of Canada. You can purchase these funds just like stocks providing the ability to buy and sell with the click of a mouse. Do your own research on the funds. I would recommend taking a look at Goldmoney. You can store physical metals in countries around the world. There is a link on this page on the right. I would also recommend having a small amount of coins at home. Take a look at the Northwest Territorial Mint. If you spread it out across all these options you will be as diversified as possible and have no exposure to the risks of the ETF's.